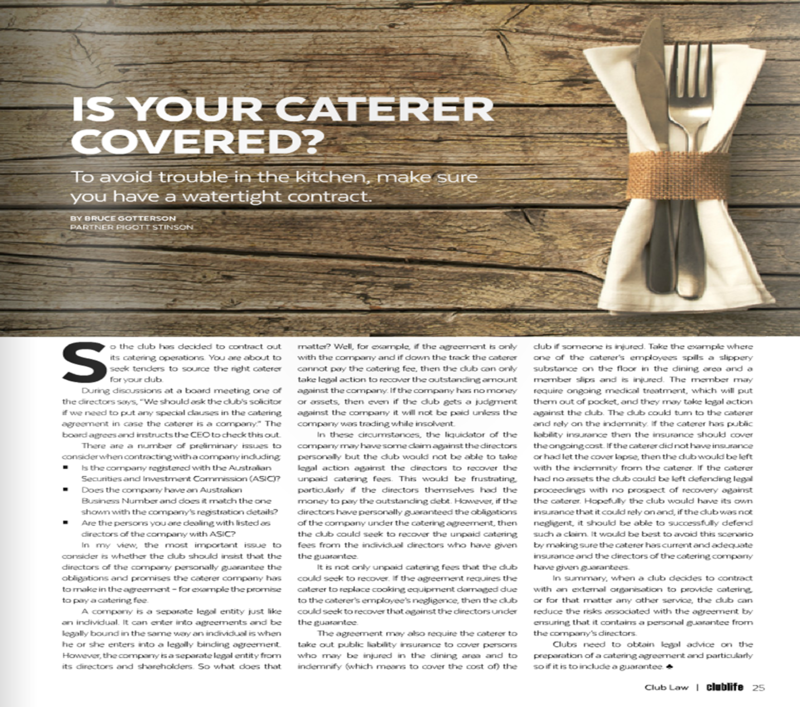 Pigott Stinson | Is Your Caterer Covered? To avoid trouble in the kitchen, make sure you have a watertight contract. This article appeared in the September 2016 issue of Club Life. So the club has decided to contract out its catering operations. You are about to seek tenders to source the right caterer for your club. During discussions at a board meeting one of the directors says, “We should ask the club’s solicitor if we need to put any special clauses in the catering agreement in case the caterer is a company.” The board agrees and instructs the CEO to check this out. Is the company registered with the Australian Securities and Investment Commission (ASIC)? Does the company have an Australian Business Number and does it match the one shown with the company’s registration details? Are the persons you are dealing with listed as directors of the company with ASIC? In my view, the most important issue to consider is whether the club should insist that the directors of the company personally guarantee the obligations and promises the caterer company has to make in the agreement – for example the promise to pay a catering fee. A company is a separate legal entity just like an individual. It can enter into agreements and be legally bound in the same way an individual is when he or she enters into a legally binding agreement. However, the company is a separate legal entity from its directors and shareholders. So what does that matter? Well, for example, if the agreement is only with the company and if down the track the caterer cannot pay the catering fee, then the club can only take legal action to recover the outstanding amount against the company. If the company has no money or assets, then even if the club gets a judgment against the company it will not be paid unless the company was trading while insolvent. In these circumstances, the liquidator of the company may have some claim against the directors personally but the club would not be able to take legal action against the directors to recover the unpaid catering fees. This would be frustrating, particularly if the directors themselves had the money to pay the outstanding debt. However, if the directors have personally guaranteed the obligations of the company under the catering agreement, then the club could seek to recover the unpaid catering fees from the individual directors who have given the guarantee. It is not only unpaid catering fees that the club could seek to recover. If the agreement requires the caterer to replace cooking equipment damaged due to the caterer’s employee’s negligence, then the club could seek to recover that against the directors under the guarantee. The agreement may also require the caterer to take out public liability insurance to cover persons who may be injured in the dining area and to indemnify (which means to cover the cost of) the club if someone is injured. Take the example where one of the caterer’s employees spills a slippery substance on the floor in the dining area and a member slips and is injured. The member may require ongoing medical treatment, which will put them out of pocket, and they may take legal action against the club. The club could turn to the caterer and rely on the indemnity. 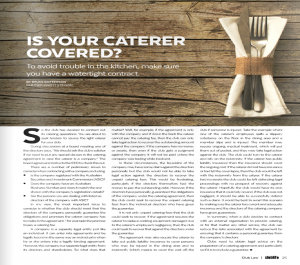 If the caterer has public liability insurance then the insurance should cover the ongoing cost. If the caterer did not have insurance or had let the cover lapse, then the club would be left with the indemnity from the caterer. If the caterer had no assets the club could be left defending legal proceedings with no prospect of recovery against the caterer. Hopefully the club would have its own insurance that it could rely on and, if the club was not negligent, it should be able to successfully defend such a claim. It would be best to avoid this scenario by making sure the caterer has current and adequate insurance and the directors of the catering company have given guarantees. In summary, when a club decides to contract with an external organisation to provide catering, or for that matter any other service, the club can reduce the risks associated with the agreement by ensuring that it contains a personal guarantee from the company’s directors. Clubs need to obtain legal advice on the preparation of a catering agreement and particularly so if it is to include a guarantee. Click on the image below to see the article as it appeared in Club Life September 2016.